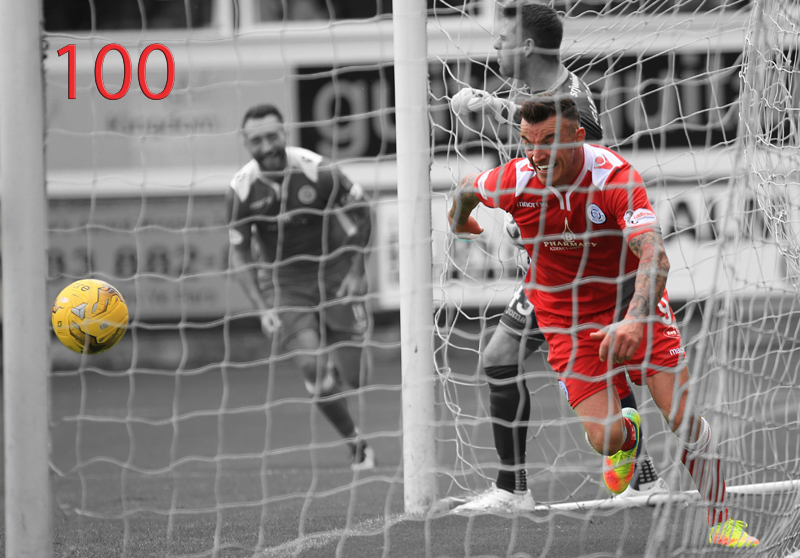 It`s been the moment all Doonhamers have been waiting for this season, Derek Lyle reaching the magic 100 goal landmark. 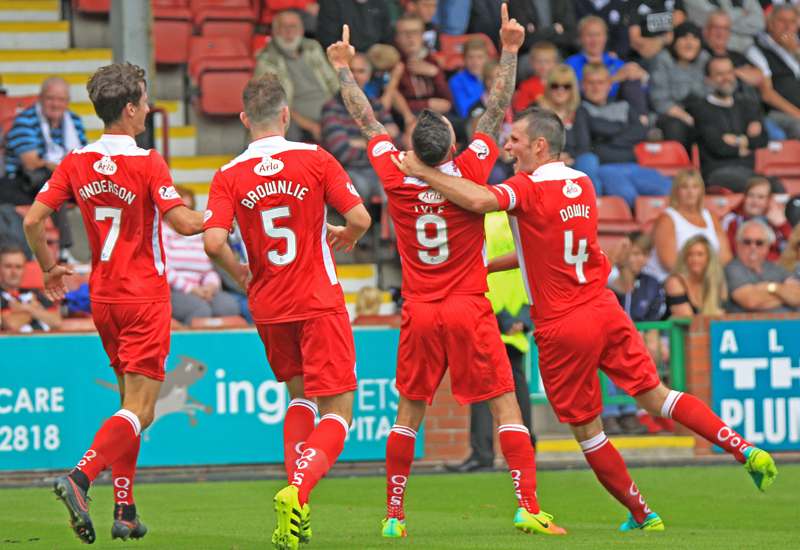 The Tan Man struck gold on the stroke of half-time, guiding home an Andy Dowie header from close-range. 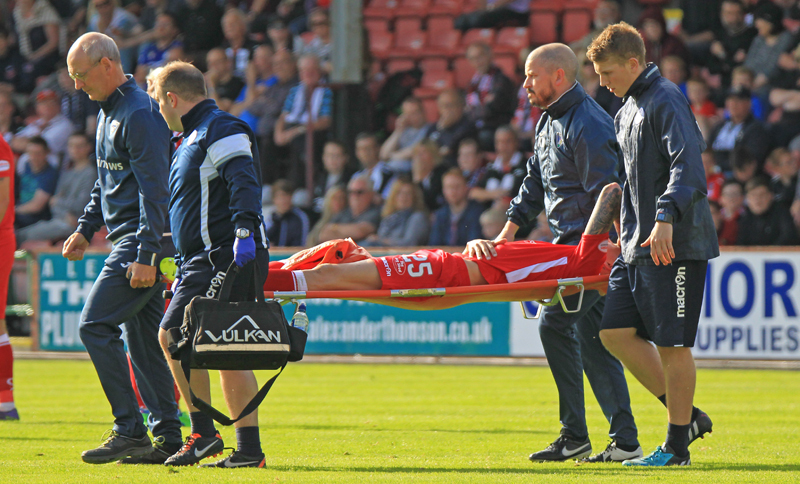 Dunfermline`s day went from bad to worse in the second period as Jason Talbot was sent packing after a late challenge on Kyle Jacobs. The ten men did their best to try and level the match but Queens managed to sustain the downpour of late pressure and held out for what could be a vital away victory. Following last week`s 2-0 victory at home to Falkirk, Queens manager Gavin Skelton kept the same starting eleven for the first time this season. The Doonhamers came into the match undefeated in the league and with the news in midweek that Stephen Dobbie had signed a contract-extension extending his stay until 2018, were in a joyous mood ahead of the match. Captain Chris Higgins was fit enough for a place on the substitutes bench. League One champions Dunfermline lined up with three former Queens players in their starting line-up. Popular striker Gavin Reilly, midfielder Michael Paton and goalkeeper David Hutton all started for ex-Queens gaffer Allan Johnston. 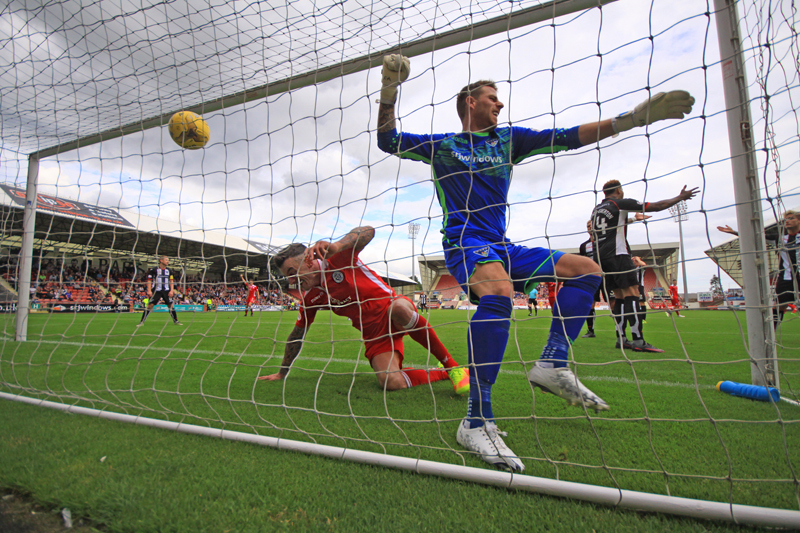 The last time Queens played at East End Park was in 2011 when the hosts ran out 6-1 victors. It was a fairly even start at East End Park, with the visitors just shading the possession. Stephen Dobbie threatened to get close to shoot but centre-back Ben Richards-Everton made a crucial tackle before the striker could pull the trigger. Queens were beginning to take the game to the hosts and most of the play was in the home end. In 12 minutes Mark Millar sent a through ball to Grant Anderson but was fouled by Jason Talbot, just outside the box. Referee Craig Charleston decided not to brandish a card, even though it appeared Anderson was denied a clear goal-scoring opportunity. Derek Lyle lined up the free-kick, from 20-yards out, and he curled the ball around the wall to first smash the right-hand post, then the left post before Hutton cleared the ball to safety. It was unlucky for Del as it would have been a sensational way to reach the 100th goal landmark. Skelton`s men continued to put pressure on the Pars, Dobbie played the ball left to Lyndon Dykes but before he could get a shot away, Ashcroft managed to make a superb tackle just in time. But two minutes later the hosts had a penalty shout as Ryan Williamson sprinted into the box and Jordan Marshall appeared to have pushed the defender but both the referee and his assistant waved away the home side`s protests. The Fifers got their first shot on target away in the 20th minute after Rhys McCabe and Michael Moffat combined to create an opportunity for Williamson but stand-in captain Andy Dowie blocked the shot. Back at the other end Anderson glided past Talbot on the right and his delivery was headed wide of Hutton`s far post by Lyle. 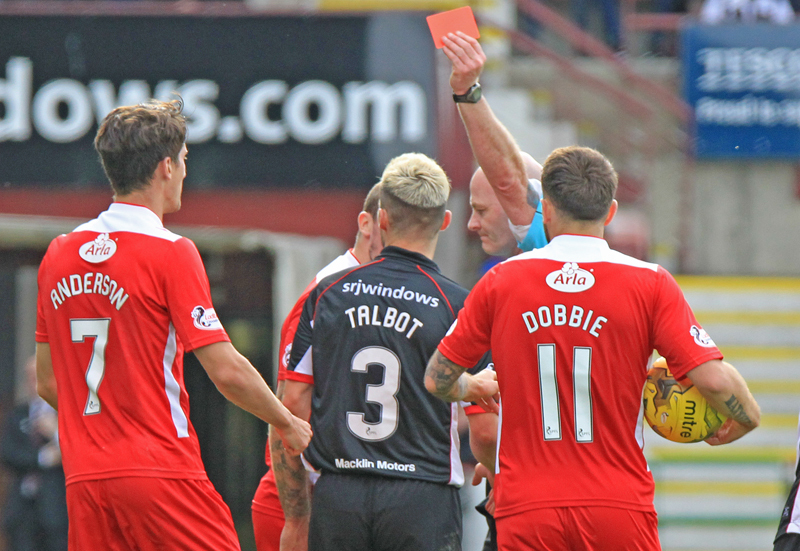 Dunfermline were awarded a 30th minute free-kick when Darren Brownlie fouled Kallum Higginbotham, 25-yards out. Higginbotham took the setpiece but floated his tame effort over the crossbar. Four minutes later the visitors could have taken the lead as Dowie rose the highest to a Hamill corner but his header flew over the bar. 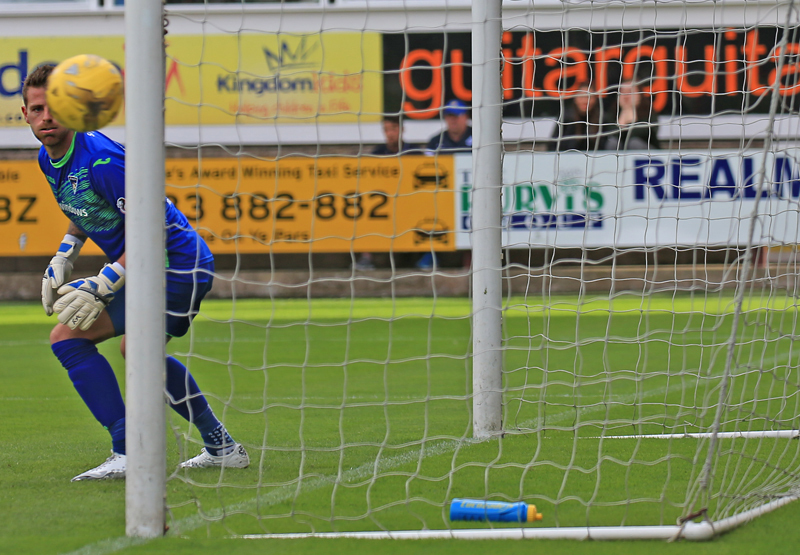 Queens were beginning to find space in the Dunfermline defence and after a slack pass from McCabe sent Dobbie away on goal but dragged his strike wide of the right post. The chances were now becoming more frequent and this time the hosts could have got the breakthrough. Reilly crossed from the left to Higginbotham to allow Moffat a shot from six-yards but he fired straight at `keeper Lee Robinson. Higginbotham had a chance of his own as he curled an effort inches wide after collecting the ball from Moffat. Queens broke forward after a misplaced pass from Ashcroft sent Dobbie away and played through Lyle, but the striker`s curling shot from 20-yards fizzled over the bar. With the interval fast approaching Dobbie was taken down by McCabe and awarded a free-kick 30-yards out. Hamill sent in the set-piece to Dowie at the far-post where he headed the ball back across the face of goal for Derek Lyle to head in his 100th goal for the club, an incredible achievement from a great striker. 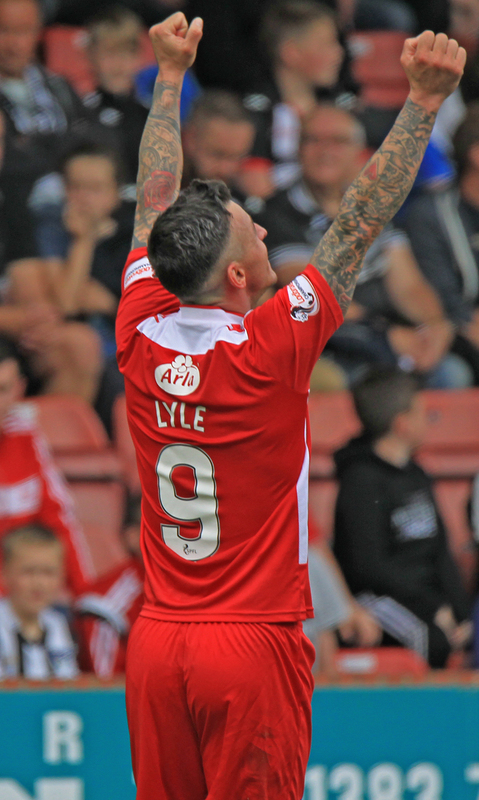 Lyle`s header would be the last talking point of a first-half which could have had more goals. Before the second period kicked off, Allan Johnston made his first substitution, bringing on Paul McMullan for Kallum Higginbotham. But it was Queens who started the brightest. Millar played to Hamill on the right, and the right-back switched the ball to Dykes but his attempt flew over Hutton`s net. 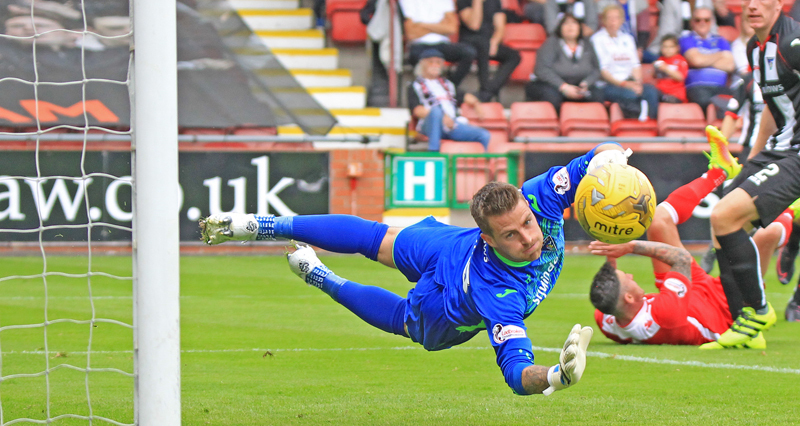 Dunfermline`s defence looked to be all over the place and couldn`t manage to get the ball clear. Luckily for the Pars, Queens couldn`t punish them for their mistakes. Hamill`s corner in 50 minutes created uncertainty in the Pars defence as Hutton and Talbot both left the clearance and in stepped Dobbie but could only drag his low powerful effort wide. When the hosts were on the attack they looked dangerous and almost grabbed an equaliser in 54 minutes. Paton sprayed the ball to Moffat on the left and he squared to McCabe but his 20-yard shot drifted wide of Robinson`s goal. On the hour mark, substitute McMullan brought down Hamill on the half-way line. No one would have complained if referee Craig Charleston decided to show a yellow card to McMullan but was lenient and gave the midfielder a warning. But Charleston was forced to get his cards out two minutes later as the Pars were reduced to ten men. Left-back Jason Talbot went in late with both feet on Kyle Jacobs and left the referee no option but to send him off. 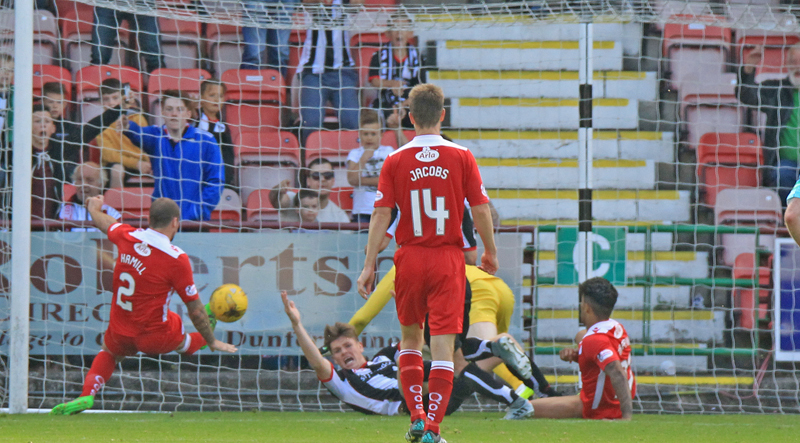 Dunfermline were forced to hook striker Moffat for defender Lewis Morgan. With 20 minutes remaining, Jacobs powered a shot high into the stand before Gavin Skelton made his first change of the afternoon. Dale Hilson entered the fray for Derek Lyle. Lyle went off to a great reception from the travelling Doonhamers, who had been in fine voice throughout the game. Hilson`s first involvement could have ended the game as a contest, the substitute sprayed the ball to Dobbie and played in Dykes who turned his marker but his shot was blocked by Ashcroft. The visitors were looking to kill the match, this time Dobbie tried the spectacular from 30-yards but in the end Hutton gathered the ball comfortably. Both sides collected bookings in the matter of seconds, through Ashcroft and Marshall. Queens had a great chance in 78 minutes but Hilson`s final pass to Dobbie was too strong and couldn`t control the ball and flashed out for a goal-kick. Lewis Spence replaced McCabe for the final ten minutes for the Fifers. Queens were forced into their second change with seven minutes remaining. Dykes went down with an ankle injury and was stretchered off, hopefully it`s not a serious injury as the Aussie once again was impressive on the left. Allan Johnston`s ten men were now forcing their way forward and Reilly was brought down by Dowie on the left yards from the box but defender Richards-Everton headed over from Paton`s cross. With the finish line in sight for the Doonhamers, they had an almighty scare with a minute remaining. 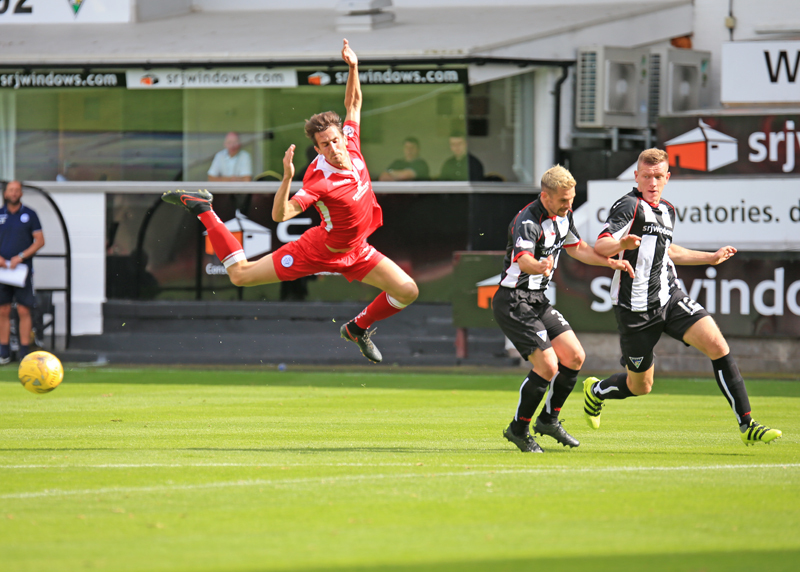 Pars` captain Geggan powered a stinging shot on target from 25-yards out. 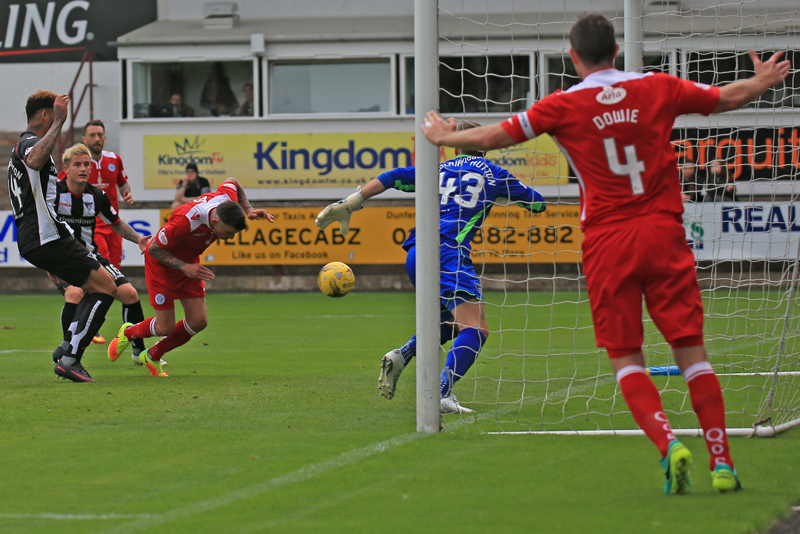 Robinson couldn`t hold onto the ball and Spence followed up but his strike was cleared off the line by Hamill and Williamson headed the ball into Robinson`s arms. Derek Lyle`s 100th goal for Queens secured a 1-0 victory for the Doonhamers. Next up for Gavin Skelton and co is Stenhousemuir in the Irn Bru Cup on Saturday at Palmerston. 14:50 After Queens` victory last week, Gavin Skelton has selected the same starting XI. Captain Chris Higgins is on the substitutes bench. 14:59 The teams are out and we are only moments from kick-off at East End Park. 7 min Fairly even start here, no real chances to report. 11 min Millar floats the ball in,Anderson breaks free and is fouled just outside the box. 12 min Lyle lines up the free-kick. 12 min Lyle curls his free-kick, hits off the right-hand side post and then the left post. So unlucky. 17 min Dobbie plays in Dykes on the left but his shot is blocked and kept in by Hutton. 19 min Hamill`s cross is cleared out for a corner. 25 min Anderson crosses in to Lyle and his header flashes wide. Still 0-0. 27 min Brownlie fouls Higginbotham 25-yards out. 28 min Higginbotham floats the ball over Robinson`s bar.Still 0-0. 29 min Hamill`s deep cross is deflected out for a corner. 30 min Hamill hits in the corner, Dowie leaps the highest but his header goes over the bar. 34 min Pressure from the hosts as Marshall clears the ball out but Higginbotham skies an effort over the bar. 35 min Dobbie drags his effort wide. Still 0-0. 37 min Ball comes in to Moffat but his effort from six-yards is straight at Robinson. 38 min Higginbotham collects the ball and curls an effort inches wide. Still 0-0. 43 min Ashcroft misplaces a pass to Dobbie, he plays the ball left to Lyle but his effort goes over the bar. 45 min McCabe fouls Dobbie 30-yards out. Hamill to take the free-kick. 45+1 min Hamill crosses in and Dowie heads across the goal and Lyle scores from close-range. Welcome to the 100 club Del. Half Time The teams are back out and we are moments from the second half. 48 min After nice play from Queens. Dykes gets a shot away but flies over. 55 min Moffat squares to McCabe and his powerful low effort is just inches wide. 62 min Talbot is shown a red card for high challenge on Jacobs. 69 min Jacobs long-range effort goes over the bar. 72 min Lyle comes off to a great reception from the Queens fans, who have been fantastic today behind the goal. 73 min Marshall brought down by Ashcroft and picks up a yellow card. 74 min The hosts counter and Marshall holds Reilly`s shirt and is booked. 75 min Paton`s free-kick is cleared by Dowie. 76 min Dykes turns the defender but his shot is blocked. 76 min Corner for Queens. 77 min Dobbie tries his luck from long-range but Hutton gathers the ball. 79 min Dykes plays in Hilson on the left, squares the ball to Dobbie but he can`t control it and goes out for a goal-kick. 84 min Dykes looked to go over on his ankle. 86 min Dowie booked for a trip on Reilly just outside the box. 88 min Richards-Everton heads over. 90 min Reilly`s shot is cleared off the line by Hamill. 90+1 min Paton flies his free-kick to Richards-Everton but is saved by Robinson. 90+4 min Late corner for Dunfermline.